Map of the division of the states during the American Civil War. Blue (the U.S. Army's uniform color) indicates the Union states; light blue represents Union states which permitted slavery (border states); red represents Confederate states. White or unshaded areas were territories. The flag of the United States of America from 1861 to 1863. The southern states were still represented in the number of stars in the flag, since the Confederacy's secession from the Union was considered illegal in the north. In 1863, a star was added to represent the new state of West Virginia. During the American Civil War, the Union was the term used to refer to the United States of America, and specifically to the national government and the 20 other free states and five Border states (American Civil War) slave states which supported it. The Union was opposed by 11 southern slave states that had declared a secession to join together to form the Confederacy. The Union is sometimes referred to as "the North", both then and now, as opposed to the Confederacy, which was "the South". The Union never recognized the legitimacy of the Confederacy's secession and insisted at all times that it remained entirely a part of the United States of America. In foreign affairs the Union was the only side recognized by all other nations, none of which officially recognized the Confederate government. The term originated in the Perpetual Union of the Articles of Confederation and Perpetual Union. The Constitution of 1787 opens with, "We the People of the United States, in Order to form a more perfect Union...do ordain and establish this Constitution for the United States of America." Even before the war started, the phrase "preserve the Union" was commonplace and a "union of states" had been used to refer to the entire United States. Using the term "Union" to apply to the non-secessionist side carried a connotation of legitimacy as the continuation of the pre-existing political entity. In comparison to the Confederacy, the Union had a large industrialized and urbanized area (the Northeast), and more advanced commercial, transportation and financial systems than the rural South. The Union states had a manpower advantage of 5 to 2 at the start of the war. However, year by year, the Confederacy shrank and lost control of more and more resources and population. Meanwhile the Union turned its growing potential advantage into a much stronger military force. However, much of the Union strength had to be used to garrison conquered areas and protect railroads and other vital points. The Union's great advantages in population and industry would prove to be vital long-term factors in its victory over the Confederacy, but it took a long while to fully mobilize its resources. The thunderclap of Sumter produced a startling crystallization of Northern sentiment....Anger swept the land. From every side came news of mass meetings, speeches, resolutions, tenders of business support, the muster of companies and regiments, the determined action of governors and legislatures." "At the time, Northerners were right to wonder at the near unanimity that so quickly followed long months of bitterness and discord. It would not last throughout the protracted war to come – or even through the year – but in that moment of unity was laid bare the common Northern nationalism usually hidden by the fierce battles more typical of the political arena." 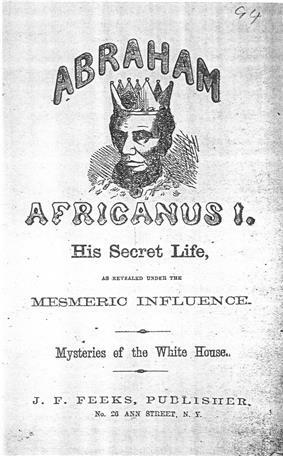 Abraham Lincoln, an ungainly giant, did not look the part of a president, but historians have overwhelmingly praised the "political genius" of his performance in the role. His first priority was military victory, and that required that he master entirely new skills as a master strategist and diplomat. He supervised not only the supplies and finances, but as well the manpower, the selection of generals, and the course of overall strategy. Working closely with state and local politicians he rallied public opinion and (at Gettysburg) articulated a national mission that has defined America ever since. Lincoln's charm and willingness to cooperate with political and personal enemies made Washington work much more smoothly than Richmond. His wit smoothed many rough edges. Lincoln's cabinet proved much stronger and more efficient than Davis's, as Lincoln channeled personal rivalries into a competition for excellence rather than mutual destruction. With William Seward at State, Salmon P. Chase at the Treasury, and (from 1862) Edwin Stanton at the War Department, Lincoln had a powerful cabinet of determined men; except for monitoring major appointments, Lincoln gave them full rein to destroy the Confederacy. The Republican Congress passed many major laws that reshaped the nation's economy, financial system, tax system, land system, and higher education system, including the Morrill tariff, the Homestead Act, the Pacific Railroad Act, and the National Banking Act. Lincoln paid relatively little attention to this legislation as he focused on war issues, but he worked smoothly with powerful Congressional leaders such as Thaddeus Stevens (on taxation and spending), Charles Sumner (on foreign affairs), Lyman Trumbull (on legal issues), Justin Smith Morrill (on land grants and tariffs) and William Pitt Fessenden (on finances). Military and Reconstruction issues were another matter, and Lincoln as the leader of the moderate and conservative factions of the Republican Party often crossed swords with the Radical Republicans, led by Stevens and Sumner. Author Bruce Tap shows that Congress challenged Lincoln's role as commander-in-chief through the Joint Committee on the Conduct of the War. It was a joint committee of both houses that was dominated by Radicals who took a hard line against the Confederacy. During the 37th and 38th Congresses, it investigated every aspect of Union military operations, with special attention to finding the men guilty of military defeats. They assumed an inevitable Union victory, and failure seemed to them to indicate evil motivations or personal failures. They were skeptical of military science and especially the graduates of the US Military Academy at West Point, many of alumni of which were leaders of the enemy army. They much preferred political generals with a known political record. Some committee suggested that West Pointers who engaged in strategic maneuver were cowardly or even disloyal. It ended up endorsing incompetent but politically correct generals. The opposition came from Copperheads, who were Southern sympathizers in the Midwest. In the East, opposition was led by the Anglo-Germans August Belmont, Samuel Morse and Fernando Wood who represented commercial interests connected to the South and Cotton. Wood's followers rioted in New York City in 1863. The Democratic Party was deeply split. In 1861 most Democrats supported the war, but with the growth of the Copperhead movement, the party increasingly split down the middle. It scored major gains in the 1862 elections, including the election of moderate Horatio Seymour as governor of New York. They gained 28 seats in the House, but remained a minority. Indiana was especially hard-fought, but when the Democrats gained control of the legislature in the 1862 election they were unable to impede the war effort, which was controlled by governor Oliver P. Morton with federal help. The Democrats nominated War Democrat in 1864 but gave him an anti-war platform. In terms of Congress the opposition was nearly powerless—and indeed in most states. In Indiana and Illinois pro-war governors circumvented anti-war legislatures elected in 1862. For 30 years after the war the Democrats carried the burden of having opposed the martyred Lincoln, the salvation of the Union and the destruction of slavery. The Copperheads were a large faction of northern Democrats who opposed the war, demanding an immediate peace settlement. They said they wanted to restore "the Union as it was" (that is, with the South and with slavery), but they realized that the Confederacy would never voluntarily rejoin the U.S. The most prominent Copperhead was Ohio's Clement L. Vallandigham, a Congressman and leader of the Democratic Party in Ohio. He was defeated in an intense election for governor in 1863. In Republican prosecutors in the Midwest accused some Copperhead activists of treason in a series of trials in 1864. Copperheadism was a grassroots movement, strongest in the area just north of the Ohio River, as well as some urban ethnic wards. Some historians have argued that it represented a traditionalistic element alarmed at the rapid modernization of society sponsored by the Republican Party. It looked back to Jacksonian Democracy for inspiration. Weber (2006) argues that the Copperheads damaged the Union war effort by fighting the draft, encouraging desertion, and forming conspiracies. However other historians say the Copperheads were a legitimate opposition force unfairly treated by the government, adding that the draft was in disrepute and that the Republicans greatly exaggerated the conspiracies for partisan reasons. Copperheadism was a major issue in the 1864 presidential election; its strength waxed when Union armies were doing poorly, and waned when they won great victories. After the fall of Atlanta in September 1864 military success seemed assured, and Copperheadism collapsed. There wasn't a shortage of enthusiasm as young men clamored to join the army in 1861. That was where the excitement was, and they were all volunteers. The decision was made to keep the small regular army intact; its officers could however join the temporary new volunteer army that was formed, expecting their experience would lead to rapid promotions. The problem with volunteering was a serious lack of planning, leadership and organization at the highest levels. Washington called on the states for troops and every northern governor set about raising and equipping regiments, with the bills sent to the War Department. The men could elect the junior officers, while the governor appointed the senior officers, and Lincoln appointed the generals. Typically politicians used their local organizations to raise troops, and were in line (if healthy enough) to become colonel. The problem was that the War Department, under the disorganized leadership of Simon Cameron also authorized local and private groups to raise regiments. The result was widespread confusion and delay. Pennsylvania for example had acute problems. When Washington called for ten more regiments, enough men volunteered to form thirty. However they were scattered among seventy different new units, none of which was a complete regiment. Not until Washington approved gubernatorial control of all new units was the problem resolved. Allan Nevins is particularly scathing in his analysis: "A President more exact, systematic and vigilant than Lincoln, a Secretary more alert and clearheaded than Cameron, would have prevented these difficulties." By the end of 1861 700,000 soldiers were drilling in Union camps. The first wave in spring was called up for only 90 days, then went home or reenlisted. Later waves enlisted for three years. They spent their time drilling. The combat in the first year, though strategically important, involved relatively small forces and few casualties. Sickness was a much more serious cause of hospitalization or death. In the first few months men wore low quality uniforms made of "shoddy" but by fall sturdy wool uniforms—in blue—were standard. The nation's factories were converted to produce the rifles, cannon, wagons, tents, telegraph sets and the myriad other special items the army needed. While business had been slow or depressed in spring 1861 because of war fears and Southern boycotts, by fall business was hiring again, offering young men jobs that were an alternative way to help win the war. Nonpartisanship was the rule in the first year, but by summer 1862 many Democrats had stopped supporting the war effort and volunteering fell off sharply in their strongholds. The calls for more and more soldiers continued, so states and localities responded by offering cash bonuses. By 1863 a draft law was in effect, but few men actually were drafted and served, since it was designed to get them to volunteer or hire a substitute. Others hid away or left the country. 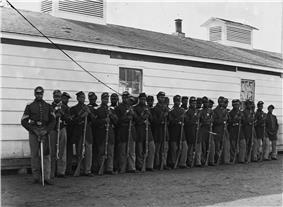 With the Emancipation proclamation taking effect in January 1863, localities could meet their draft quota by sponsoring regiments of ex-slaves organized in the South. Michigan was especially eager to send thousands of volunteers. A study of the cities of Grand Rapids and Niles shows an overwhelming surge of nationalism in 1861, whipping up enthusiasm for the war in all segments of society, and all political, religious, ethnic, and occupational groups. However by 1862 the casualties were mounting and the war was increasingly focused on freeing the slaves in addition to preserving the Union. Copperhead Democrats called the war a failure, and it became more and more a partisan Republican effort. Michigan voters in remained evenly split between the parties in the presidential election of 1864. More soldiers died of disease than in battle, and even larger numbers were temporarily incapacitated by wounds, disease and accidents. The Union responded by building army hospitals in every state. The hygiene of the camps was poor, especially at the beginning of the war when men who had seldom been far from home were brought together for training with thousands of strangers. First came epidemics of the childhood diseases of chicken pox, mumps, whooping cough, and, especially, measles. Operations in the South meant a dangerous and new disease environment, bringing diarrhea, dysentery, typhoid fever, and malaria. There were no antibiotics, so the surgeons prescribed coffee, whiskey, and quinine. Harsh weather; bad water; inadequate shelter in winter quarters; poor policing of camps; and dirty camp hospitals took their toll. This was a common scenario in wars from time immemorial, and conditions faced by the Confederate army were even worse. What was different in the Union was the emergence of skilled, well-funded medical organizers who took proactive action, especially in the much enlarged United States Army Medical Department, and the United States Sanitary Commission, a new private agency. Numerous other new agencies also targeted the medical and morale needs of soldiers, including the United States Christian Commission as well as smaller private agencies such as the Women's Central Association of Relief for Sick and Wounded in the Army (WCAR) founded in 1861 by Henry Whitney Bellows, a Unitarian minister, and social reformer Dorothea Dix. Systematic funding appeals raised public consciousness, as well as millions of dollars. Many thousands of volunteers worked in the hospitals and rest homes, most famously poet Walt Whitman. Frederick Law Olmsted, a famous landscape architect, was the highly efficient executive director of the Sanitary Commission. States could use their own tax money to support their troops as Ohio did. Under the energetic leadership of Governor David Tod, a War Democrat who won office on a coalition "Union Party" ticket with Republicans, Ohio acted vigorously. Following the unexpected carnage at the battle of Shiloh in April 1862, it sent 3 steamboats to the scene as floating hospitals with doctors, nurses and medical supplies. The state fleet expanded to eleven hospital ships. The state also set up 12 local offices in main transportation nodes to help Ohio soldiers moving back and forth. The Christian Commission comprised 6000 volunteers who aided chaplains in many ways. For example, its agents distributed Bibles, delivered sermons, helped with letters home, taught men to read and write, and set up camp libraries. The Army learned many lessons and modernized its procedures. Medical science—especially surgery—made many advances. Silber, Nina. Daughters of the Union: Northern Women Fight the Civil War. Harvard U. Press, 2005. 332 pp. Venet, Wendy Hamand. A Strong-Minded Woman: The Life of Mary Livermore. U. of Massachusetts Press, 2005. 322 pp. Current, Richard N. (1994). Lincoln's Loyalists: Union Soldiers from the Confederacy. Oxford, England: Oxford University Press. ^ Gary W. Gallagher (2001). The American Civil War: The War in the East 1861 - May 1863. Osprey Publishing. p. 22. ^ Robert E., Mitchell, “Civil War Recruiting and Recruits from Ever-Changing Labor Pools: Midland County, Michigan, as a Case Study,” Michigan Historical Review, 35 (Spring 2009), 29–60. ^ Michael Perman and Amy Murrell Taylor, eds. (2010). Major Problems in the Civil War and Reconstruction. Cengage. p. 178. ^ Frank R. Freemon, "Lincoln finds a surgeon general: William A. Hammond and the transformation of the Union Army Medical Bureau." Civil War History (1987) 33#1 pp: 5-21. ^ James Ford Rhodes (1904). History of the United States from the Compromise of 1850: 1864-1866. Harper & Brothers. pp. 507–8. ^ Sarah T. Phillips et al. "Reflections on One Hundred and Fifty Years of the United States Department of Agriculture," Agricultural History (2013) 87#3 pp 314-367. The Indian Territory saw its own civil war, as the major tribes held slaves and endorsed the Confederacy. West Virginia separated from Virginia and became part of the Union during the war, on June 20, 1863. Nevada also joined the Union during the war, becoming a state on October 31, 1864. †Had two state governments, one Unionist one Confederate, both claiming to be the legitimate government of their state. Kentucky and Missouri's Confederate governments never had significant control of their state. In response to the growing problem of locally organized guerrilla campaigns throughout 1863 and 1864, in June 1864, Maj. Gen. Stephen G. Burbridge was given command over the state of Kentucky. This began an extended period of military control that would last through early 1865, beginning with martial law authorized by President Abraham Lincoln. To pacify Kentucky, Burbridge rigorously suppressed disloyalty and used economic pressure as coercion. His guerrilla policy, which included public execution of four guerrillas for the death of each unarmed Union citizen, caused the most controversy. After a falling out with Governor Thomas E. Bramlette, Burbridge was dismissed in February 1865. Confederates remembered him as the "Butcher of Kentucky". Some marauding units became organized criminal gangs after the war. In 1882, the bank robber and ex-Confederate guerrilla Jesse James was killed in Saint Joseph. Vigilante groups appeared in remote areas where law enforcement was weak, to deal with the lawlessness left over from the guerrilla warfare phase. For example, the Bald Knobbers were the term for several law-and-order vigilante groups in the Ozarks. In some cases, they too turned to illegal gang activity. Missouri was the scene of over 1000 engagements between Union and Confederate forces, and uncounted numbers of guerrilla attacks and raids by informal pro-Confederate bands. Western Missouri was the scene of brutal guerrilla warfare during the Civil War. Roving insurgent bands such as Quantrill's Raiders and the men of Bloody Bill Anderson terrorized the countryside, striking both military installations and civilian settlements. Because of the widespread attacks and the protection offered by Confederate sympathizers, Federal leaders issued General Order No. 11 in 1863, and evacuated areas of Jackson, Cass, and Bates counties. They forced the residents out to reduce support for the guerrillas. Union cavalry could sweep through and track down Confederate guerrillas, who no longer had places to hide and people and infrastructure to support them. On short notice, the army forced almost 20,000 people, mostly women, children, and the elderly, to leave their homes. Many never returned, and the affected counties were economically devastated for years after the end of the war. Families passed along stories of their bitter experiences down through several generations--Harry Truman's grandparents were caught up in the raids and he tells how they were kept in concentration camps. Besides organized military conflict, the border states were beset by guerrilla warfare. In such a bitterly divided state, neighbors frequently used the excuse of war to settle personal grudges and took up arms against neighbors. Still, nearly 120,000 Southern Unionists served in the Union Army during the Civil War, and Unionist regiments were raised in every southern state. Southern Unionists were extensively used as anti-guerrilla paramilitary forces. During Reconstruction many Unionists in the ex-Confederacy became "Scalawags" who supported the newly founded Republican Party. People loyal to the U.S. federal government and opposed to secession living in the border states (where slavery was legal in 1861) were termed Unionists. Confederates sometimes styled them "Homemade Yankees". However, Southern Unionists were not necessarily northern sympathizers and many of them – although opposing secession – supported the Confederacy once it was a fact. East Tennessee never supported the Confederacy, and Unionists there became powerful state leaders, including governors Andrew Johnson and William G. Brownlow. Likewise, large pockets of eastern Kentucky were Unionist and helped keep the state from seceding. Western Virginia, with few slaves and some industry, was so strongly Unionist that it broke away and formed the new state of West Virginia. All the northern states had free public school systems before the war, but not the border states. West Virginia set up its system in 1863. Over bitter opposition it established an almost-equal education for black children, most of whom were ex-slaves. Thousands of black refugees poured into St. Louis, where the Freedmen's Relief Society, the Ladies Union Aid Society, the Western Sanitary Commission, and the American Missionary Association (AMA) set up schools for their children. Caring for war orphans was an important function for local organizations as well as state and local government. A typical state was Iowa, where the private "Iowa Soldiers Orphans Home Association" operated with funding from the legislature and public donations. It set up orphanages in Davenport, Glenwood and Cedar Falls. The state government funded pensions for the widows and children of soldiers. There were numerous children's magazines such as Merry's Museum, The Student and Schoolmate, Our Young Folks, The Little Pilgrim, Forrester's Playmate, and The Little Corporal. They showed a Protestant religious tone and "promoted the principles of hard work, obedience, generosity, humility, and piety; trumpeted the benefits of family cohesion; and furnished mild adventure stories, innocent entertainment, and instruction." Their pages featured factual information and anecdotes about the war along with related quizzes, games, poems and songs, short oratorical pieces for "declamation," short stories, and very short plays that children could stage. They promoted patriotism and the Union war aims, fostered kindly attitudes toward freed slaves, blackened the Confederates cause, encouraged readers to raise money for war-related humanitarian funds, and dealt with the death of family members. By 1866, the Milton Bradley Company was selling "The Myriopticon: A Historical Panorama of the Rebellion" that allowed children to stage a neighborhood show that would explain the war. It comprised colorful drawings that were turned on wheels and included pre-printed tickets, poster advertisements, and narration that could be read aloud at the show. Frank reports that what it meant to be a father varied with status and age, but most men demonstrated dual commitments as providers and nurturers and believed that husband and wife had mutual obligations toward their children. The war privileged masculinity, dramatizing and exaggerating, father-son bonds. Especially at five critical stages in the soldier's career (enlistment, blooding, mustering out, wounding, and death) letters from absent fathers articulated a distinctive set of 19th-century ideals of manliness. Many Northerners had only recently become religious (following the Second Great Awakening) and religion was a powerful force in their lives. No denomination was more active in supporting the Union than the Methodist Episcopal Church. Carwardine argues that for many Methodists, the victory of Lincoln in 1860 heralded the arrival of the kingdom of God in America. They were moved into action by a vision of freedom for slaves, freedom from the persecutions of godly abolitionists, release from the Slave Power's evil grip on the American government, and the promise of a new direction for the Union. Methodists formed a major element of the popular support for the Radical Republicans with their hard line toward the white South. Dissident Methodists left the church. During Reconstruction the Methodists took the lead in helping form Methodist churches for Freedmen, and moving into Southern cities even to the point of taking control, with Army help, of buildings that had belonged to the southern branch of the church. Grant Brodrecht's doctoral dissertation, "Our Country," explores the conjunction of mainstream northern Protestant thought and feeling regarding America with the bundle of ideas associated with Union during the Civil War and Reconstruction, arguing that non-radical Protestants consistently subordinated concern for African-American slaves and ex-slaves to an overarching vision for the nation as a specifically Christian people. The title, adapted from a collection of war-time sermons by the Methodist George Peck (1865) and alluding to Josiah Strong’s better-known work (1885), refers to the proprietary regard for the nation maintained by most mid-nineteenth-century Protestants. Such Protestants were generally evangelical and made up what historians recognize as the most powerful American subculture at the time. The sense that America was “our country” carried a dual meaning. First, like many Americans, Protestants felt responsibility for America as that country gloriously created and handed down to them by the Founding Fathers. In addition, most were powerfully actuated by an ingrained notion that since the seventeenth century God had been providentially at work creating and sustaining a Christian (and essentially Protestant) American people unto himself. To Protestants at mid-century, the notion of Union evocatively encapsulated both senses. This Union, as object of affection and imagination, often included the territory and government of the United States, but most importantly it referred to one whole people possessing a sacred heritage and a divine mission. In short, Union connoted all that was seemingly good in America—republican liberty, equality of opportunity, material prosperity, progress, hope, and glorious world prominence. Accordingly, the Civil War and Reconstruction appeared as a monumental crisis and threat. Protestants’ understanding of the Union as their sacred country obligated them to resist the Union’s dissolution and then to ensure that it remained infused with Protestant Christianity when restored. Perhaps ironically, this tradition helped bring about the end of slavery in defense of the Union, while also predisposing many northern Protestants to look past, if not entirely forget, the ex-slaves following the war. The Treasury started buying cotton during the war, for shipment to Europe and northern mills. The sellers were Southern planters who needed the cash, regardless of their patriotism. The Northern buyers could make heavy profits, which annoyed soldiers like Ulysses Grant. He blamed Jewish traders and expelled them from his lines in 1862, but Lincoln quickly overruled this show of anti-semitism. Critics said the cotton trade helped the South, prolonged the war and fostered corruption. Lincoln decided to continue the trade for fear that Britain might intervene if its textile manufacturers were denied raw material. Another goal was to foster latent Unionism in Southern border states. Northern textile manufacturers needed cotton to remain in business and to make uniforms, while cotton exports to Europe provided an important source of gold to finance the war. The Union used hundreds of thousands of animals. The Army had plenty of cash to purchase them from farmers and breeders, but especially in the early months the quality was mixed. Horses were needed for cavalry and artillery. Mules pulled the wagons. The supply held up, despite an unprecedented epidemic of glanders, a fatal disease that baffled veterinarians. In the South, the Union army shot all the horses it did not need to keep them out of Confederate hands. 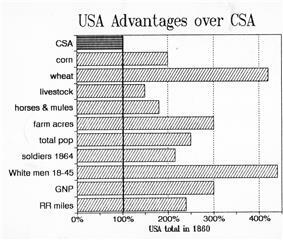 Agriculture was the largest single industry and it prospered during the war. Prices were high, pulled up by a strong demand from the army and from Britain (which depended on American wheat for a fourth of its food imports.) The war acted as a catalyst which encouraged the rapid adoption of horse-drawn machinery and other implements. The rapid spread of recent inventions such as the reaper and mower made the work force efficient, even as hundreds of thousands of farmers were in the army. Many wives took their place, and often consulted by mail on what to do; increasingly they relied on community and extended kin for advice and help. The 1862 Homestead Act opened up the public domain lands for free. Land grants to the railroads meant they could sell tracts for family farms (80 to 200 acres) at low prices with extended credit. In addition the government sponsored fresh information, scientific methods and the latest techniques through the newly established Department of Agriculture and the Morrill Land Grant College Act. The U.S. government owned vast amounts of good land (mostly from the Louisiana Purchase of 1803 and the Oregon Treaty with Britain in 1846). The challenge was to make the land useful to people and to provide the economic basis for the wealth that would pay off the war debt. Land grants went to railroad construction companies to open up the western plains and link up to California. Together with the free lands provided farmers by the Homestead Law the low-cost farm lands provided by the land grants sped up the expansion of commercial agriculture in the West. Customs revenue from tariffs totaled $345 million from 1861 through 1865, or 43% of all federal tax revenue. Secretary Chase, though a long-time free-trader, worked with Morrill to pass a second tariff bill in summer 1861, raising rates another 10 points in order to generate more revenues. These subsequent bills were primarily revenue driven to meet the war's needs, though they enjoyed the support of protectionists such as Carey, who again assisted Morrill in the bill's drafting. The Morrill Tariff of 1861 was designed to raise revenue. The tariff act of 1862 served not only to raise revenue, but also to encourage the establishment of factories free from British competition by taxing British imports. Furthermore, it protected American factory workers from low paid European workers, and as a major bonus attracted tens of thousands of those Europeans to immigrate to America for high wage factory and craftsman jobs. The North's most important war measure was perhaps the creation of a system of national banks that provided a sound currency for the industrial expansion. Even more important, the hundreds of new banks that were allowed to open were required to purchase government bonds. Thereby the nation monetized the potential wealth represented by farms, urban buildings, factories, and businesses, and immediately turned that money over to the Treasury for war needs. Apart from taxes, the second major source was government bonds. For the first time bonds in small denominations were sold directly to the people, with publicity and patriotism as key factors, as designed by banker Jay Cooke. State banks lost their power to issue banknotes. Only national banks could do that, and Chase made it easy to become a national bank; it involved buying and holding federal bonds and financiers rushed to open these banks. Chase numbered them, so that the first one in each city was the "First National Bank." 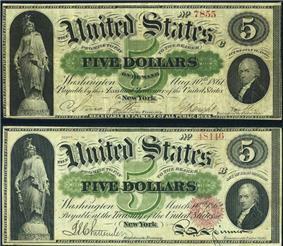 Fourth the government printed "greenbacks"—paper money—which led to endless controversy because they caused inflation. The United States needed $3.1 billion to pay for the immense armies and fleets raised to fight the Civil War — over $400 million just in 1862. Apart from tariffs, the largest new tax revenue by far came from new excise taxes—a sort of value added tax—that was imposed on every sort of manufactured item. Second came much higher tariffs, through several Morrill tariff laws. Third came the nation's first income tax; only the wealthy paid and it was repealed at war's end. In 1860 the Treasury was a small operation that funded the small-scale operations of the government through land sales and customs based on a low tariff. Peacetime revenues were trivial in comparison with the cost of a full-scale war, but the Treasury Department under Secretary Salmon P. Chase showed unusual ingenuity in financing the war without crippling the economy. Many new taxes were imposed, and always with a patriotic theme comparing the financial sacrifice to the sacrifices of life and limb. The government paid for supplies in real money, which encouraged people to sell to the government regardless of their politics. By contrast the Confederacy gave paper promissory notes when it seized property, so that even loyal Confederates would hide their horses and mules rather than sell them for dubious paper. Overall the Northern financial system was highly successful in raising money and turning patriotism into profit, while the Confederate system impoverished its patriots. The Union economy grew and prospered during the war while fielding a very large army and navy. The Republicans in Washington had a Whiggish vision of an industrial nation, with great cities, efficient factories, productive farms, all national banks, all knit together by a modern railroad system. The South had resisted policies such as tariffs to promote industry and homestead laws to promote farming because slavery would not benefit. With the South gone, and Northern Democrats very weak in Congress, the Republicans enacted their legislation. At the same time they passed new taxes to pay for part of the war, and issued large amounts of bonds to pay for the most of the rest. (The remainder can be charged to inflation. ) They wrote an elaborate program of economic modernization that had the dual purpose of winning the war and permanently transforming the economy. Small-scale riots broke out in ethnic German and Irish districts, and in areas along the Ohio River with many Copperheads. Holmes County, Ohio was an isolated parochial areas dominated by Pennsylvania Dutch and some recent German immigrants. It was a Democratic stronghold and few men dared speak out in favor of conscription. Local politicians denounced Lincoln and Congress as despotic, seeing the draft law as a violation of their local autonomy. In June 1863, small-scale disturbances broke out; they ended when the Army sent in armed units. Discontent with the 1863 draft law led to riots in several cities and in rural areas as well. By far the most important were the New York City draft riots of July 13 to July 16, 1863. Irish Catholic and other workers fought police, militia and regular army units until the Army used artillery to sweep the streets. Initially focused on the draft, the protests quickly expanded into violent attacks on blacks in New York City, with many killed on the streets. 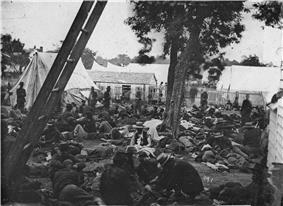 Both sides operated prison camps to handle the 409,000 soldiers captured during the war, 1861–65. The Record and Pension Office in 1901 counted 211,000 Northerners who were captured. In 1861-63 most were immediately paroled; after the parole exchange system broke down in 1863, about 195,000 went to prison camps. Some tried to escape but few succeeded. By contrast 464,000 Confederates were captured (many in the final days) and 215,000 imprisoned. Over 30,000 Union and nearly 26,000 Confederate prisoners died in captivity. Just over 12% of the captives in Northern prisons died, compared to 15.5% for Southern prisons.
. Hollerith's company became International Business Machines (IBM) in 1911.Herman Hollerith; he also figured out how to mechanically analyze data by turning it into numbers and punching onto the computer punch card as developed by his student New York Public Library) and the National Library of Medicine (now the Library of the Surgeon General's Office (1838–1913). A senior surgeon in the war, Billings built two of the world's most important libraries, John Shaw Billings The pioneer was  The Sanitary Commission collected enormous amounts of statistical data, and opened up the problems of storing information for fast access and mechanically searching for data patterns.